FBI Director Chris Wray on Wednesday defended his agency's supplemental background investigation of Brett Kavanaugh as decades-old allegations of sexual assault threatened to derail his nomination to the Supreme Court. Kavanaugh was ultimately confirmed by the Senate and sworn in to the high court. 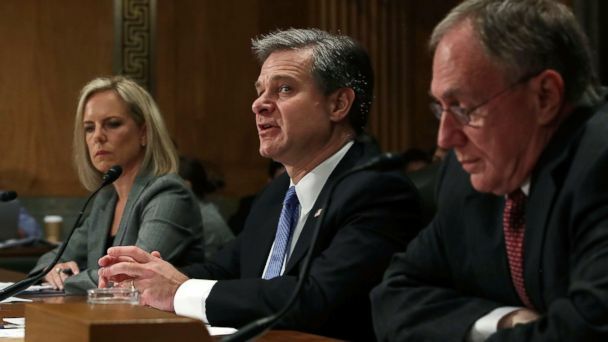 "I have spoken with our background investigation specialists and they have assured me that this was handled in the way that is consistent with their experience and the standard process," Wray told a Senate panel. Pressed by Sen. Kamala Harris, D-Calif., Wray acknowledged that the FBI's additional inquiry of Kavanaugh last week was "limited in scope." But he insisted "it's important to understand" that background investigations are "very different" than most criminal investigations. "Our only authority is as requested by the adjudicating [entity], in this case the White House," Wray added. "Our supplemental update to the previous background investigation [of Kavanaugh] was limited in scope and that is consistent with the standard process for such investigations going back quite a long ways." Wray noted there was "lots of communications" between the FBI's security division and the White House office of security about how the additional investigation should proceed. Asked by Harris whether the FBI launched an investigation into whether Kavanaugh lied to Congress during his testimony, Wray declined to answer, saying, "That's not something I could discuss here."